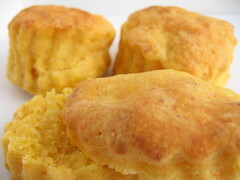 Sweet Potato Biscuits - Do You Know The Muffin Man? Notes: Ingredient notes: I used the blend of all-purpose and cake flours as I've never seen White Lily in Canada here but I found out later that I could have used Swan's Down flour which I did see at Highland Farms. After a night in the refrigerator, there wasn't much rise, but after proofing at a warm room temperature, they rose above 1 inches and even further in the oven once the baking powder kicked in. These biscuits received many favourable comments from my guests. Using all butter gives them an incredible taste, the two leaveners make them light and airy, and the flours and cooked egg yolks make them melt in your mouth.